This massive creature can grow to be 10 feet long and weigh over 2,000 pounds. It is the world’s largest land living predator. With its 42 razor‐sharp teeth, it can consume 100 pounds of food in a single meal. Although many pictures and postcards present this animal as cute and cuddly, the polar bear is one of the world’s most efficient predators. Polar bears live in the Arctic region near the outer edges of the North Pole. This area is freezing cold, and can reach temperatures of ‐50 degrees Fahrenheit. Polar bears, however, are not bothered by the extreme cold, because God designed them with special features that help them stay warm. 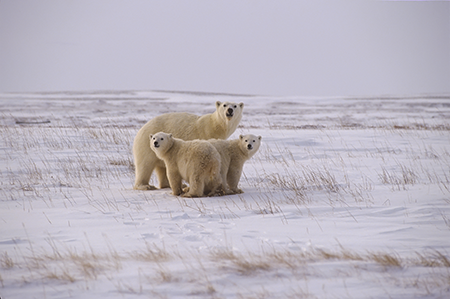 These bears have two fur coats, an outer coat composed of longer hairs that are transparent, and a thick inner coat. In addition to this thick fur, God designed polar bears with a layer of blubber that can be as much as four inches thick. Have you ever walked on ice? If you have, you know that it is very slippery. How do huge polar bears keep from slipping and sliding all over the ice? Again, God gave the bears special features. Polar bears have massive paws that can be 12 inches across. 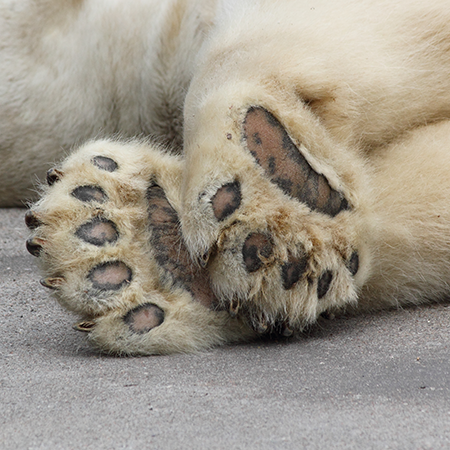 These paws are so big that they act like snow shoes and keep the bears from sinking deeply into snow. Imagine a paw as wide as a one‐foot ruler! Also, on the pads of their paws, the bears have tiny bumps called papillae (puh‐PILL‐ee) that give them traction. It is like they have been given their own set of snow tires. Polar bears have an amazing sense of smell. They eat mostly seals, and can use their noses to locate them a mile away. Sometimes, however, they eat walruses (which can be twice as large as the bears) and they have been known to eat muskoxen, whales, berries, birds, eggs, carcasses of dead animals, and even other polar bears! 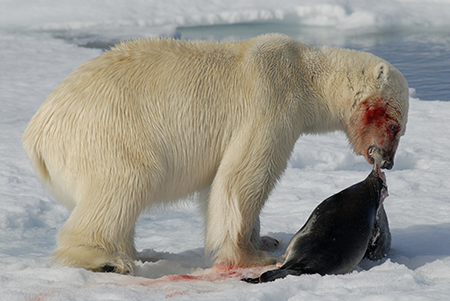 God designed polar bears to be the perfect polar predators. He gave them all the necessary tools to stay warm, keep their balance on ice, smell food far away, and hunt successfully. Polar bears could not have evolved. Without all of their God‐given tools, they could not survive in their frigid habitat.